Please stop planned killing of 2 million Australian cats. 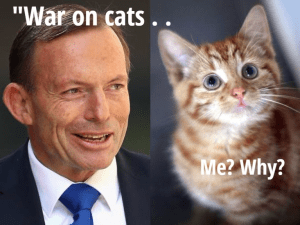 We don’t want a war on kittens! The Australian Government plans to kill over 2 million cats, with a $3.6m fund established to wipe colony cats off the face of the earth. This high risk initiative includes a website designed to dob in colony cats and a number of cat eradication programs including baiting, shooting, dogs, traps and nearly every method of killing known. The risk of cruelty to animals, with trapping, savage dog attacks, shooting and other methods that harm animals. The illogical approach of a “dob in a colony” site, showcasing trapping methods and risking home grown grudges from cat hating people. A risk to all animals through the many methods of death that do not discriminate between cat, dog, possum, bird or any animal. This program should not have snuck quietly into legislation, but been subject to public review and scrutiny. Please stop this program to allow full public review and assurance that millions of animals are not being unnecessarily killed for their only crime, of being a cat.